All you passionate sports fan, we’re sure you’re going to love our initiative to include motives of sport into romantic ketubah designs. Unfortunately for sports fanatics, hardly anything about weddings, romantic events and ceremonies incorporates sports in any way. Well, since it is our mission here at This Is Not a Ketubah, Yes It Is! to break all the rules and let our creativity and imagination run wild, there is a collection for literally everyone – including you, sports fans. We want to cater to needs of every single customer, while still keeping that romantic, sensual note of a ketubah, all wrapped in a magnificent piece of modern art. We often hear that people who are not fans of sports do not understand what’s the hype about. They don’t understand the excitement, the adrenaline rush, the happiness sports fan feel every time their favorite athlete or team wins. On the other hand, they also find it hard to wrap their minds around the fact that a single match or a game can affect a sports fan’s mood and ruin their day. There is just something magical about sports that brings people together, makes them forget about their everyday troubles, even for a couple of hours, and enjoy pure athleticism. Sports fans feel a special connection to their favorite team, player, or athlete. Something that only true and passionate sports fans can understand is the pre-game or pre-match anxiety, excitement, and celebration or disappointment they share with their favorites as if they were to share that field, court or ring with athletes. Many sports events, such as Superbowl, have become family and friend traditions. This way, sports are not just competitions since they get elevated to the next level, thus becoming an irreplaceable part of sports fans’ lives. 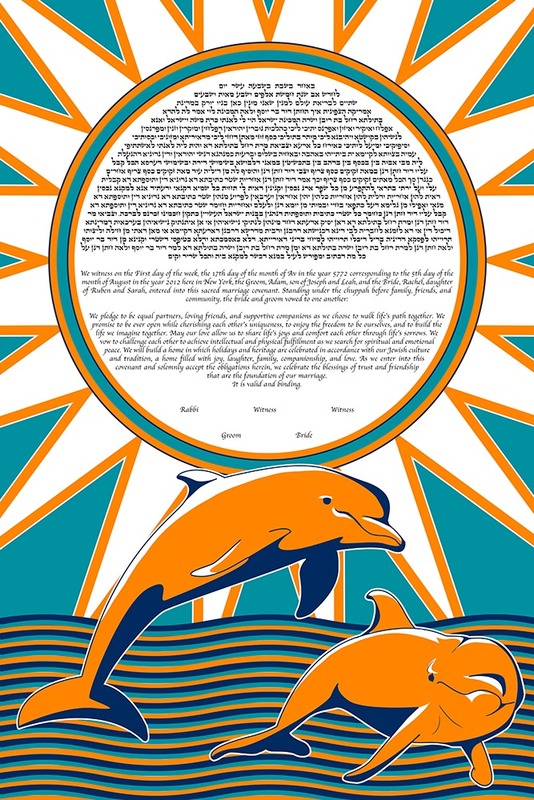 At first sight, our The Dolphins sports ketubah design may seem like a piece that belongs in the animal lovers ketubah gallery only. However, this incredibly romantic, statement-making piece is a tribute to none other than the Miami Dolphins football team. Florida residents, football lovers, and especially the Miami Dolphins “ride-or-dies” will absolutely love this sports ketubah edition, capturing a patriotic love, as well as a love for a team. In addition, this gorgeous sports ketubah piece incorporates romantic detailing represented by two dolphins symbolizing a union between two people; as well as staples of modern art, including bright colors and vivid imagery.